Made by Me Sewing Studio Ltd. » Meet Sadie! This month, Made By Me Sewing Studio is marking one year since it opened its doors. During that time I have had so many amazing kids come through the studio for lessons and birthday parties. To celebrate the studio’s one-year anniversary, I would like to introduce you to one of these talented and amazing kids – Sadie! Sadie was my first regular customer at the studio, ever since she and her grandmother came to see me last February. Since then Sadie has been a very loyal customer and has regularly been attending my camps, workshops and after school clubs. 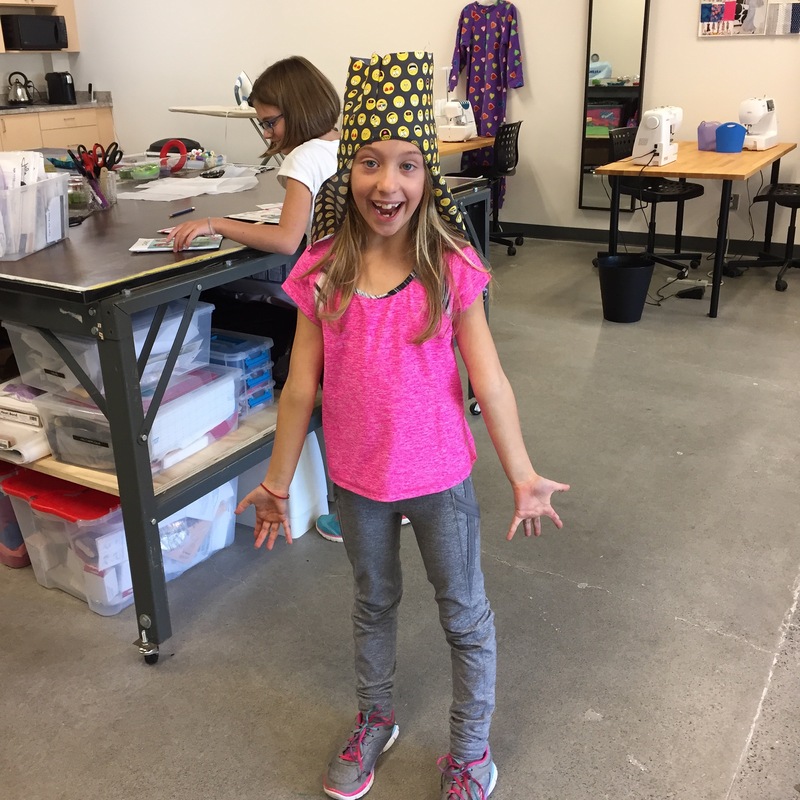 Sadie is only 9 years old but she is already quite an accomplished sewer, having completed many projects here at the studio and at home. 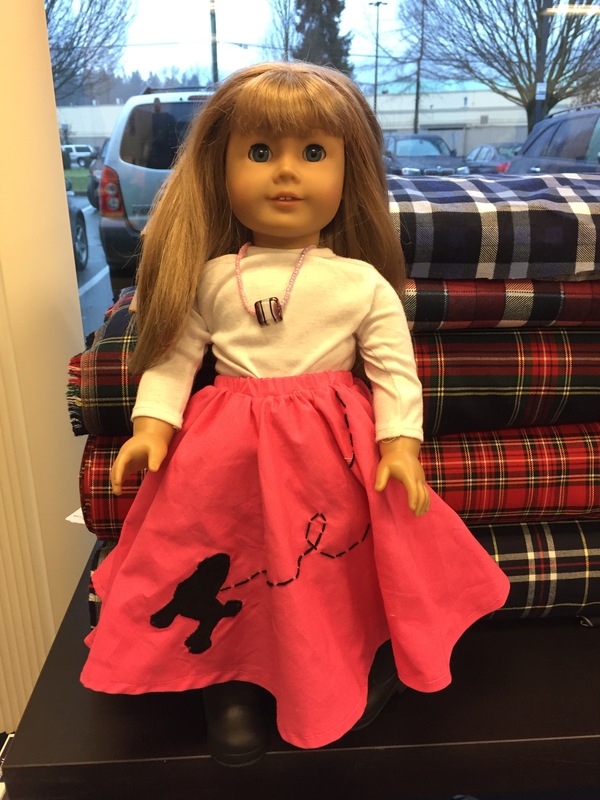 She has tackled some sewing projects that would easily intimidate sewers twice her age. I love having Sadie in the studio! She is very open to learning new things and approaches each sewing project with energy and enthusiasm. I hope she keeps sewing for many years to come! How old are you? 9 years old. 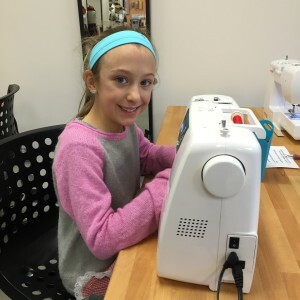 How old were you when you first started sewing? 7 years old. Who first introduced you to sewing? My mom, my nanny and my grandma. What was your first sewing project? At Made By Me, my first project was a photo pillow. Before that, I helped my mom make my Halloween costumes. What have you made since then? Two purses, a wallet, a monster stuffie, a Kleenex holder, two skirts, a pair of shorts, an easter bunny basket, three pillows, clothes for my American Girl doll and a scrunchie! What has been your best/favourite project so far? My log pillow! It is both a pillow and a stuffie! What would you like to make in the future? I would like to make a sleeping mask and a onesie! What do you like about sewing? I like the completion at the end and the sewing. I feel proud of myself that I can use a real sewing machine. Christine is the best sewing teacher. She is really nice, funny and she knows a lot about sewing. Is there anything you don’t like about it? The pinning and the cutting. It’s kinda boring. What other activities do you enjoy? Skating, skiing, gymnastics, Guides, hanging out with friends, school and playing video games! What would you like to be when you grow up? A costume designer. « Hats for Homeless Night a Huge Success!